After a 2017 campaign in which it finished .500 in conference action and 13-15 overall, the CSUDH women’s basketball team, which returns five seniors and has a promising infusion of transfers and freshmen, kicks off its new season at home Friday, Nov. 8, against Concordia University. Along with Concordia, which finished 16-11 last year in the PacWest conference, the Toros’ non-conference season includes a home game against Biola Nov. 10, and road games against Alaska Fairbanks and perennial NCAA Division II women’s basketball powerhouse Alaska Anchorage Nov. 16-17. “We set a difficult pre-season schedule intentional to prepare us for conference,” said CSUDH interim women’s basketball head coach John Bonner. Bonner said the goal in the four non-conference games is to establish the team’s identity, to help newcomers adjust to the team’s fast-paced style and to emphasize rebounding and improved defense. The Toros have five returning players, three of whom are crucial in offense. Senior Nautica Morrow led the team in points (17.9), free throw percentage (74 percent), and steals (97) and was named first-team all-California College Athletics Association. Also, last season’s best three-point shooter, Heaven Holmes, is returning. She averaged 144 three-pointers attempts, making 50 for an average of 35 percent. Bonner added that returners Zhane Carter, the team’s third-leading scorer last season, Dijour Ledbetter and Destinee Williams will also make an impact, particularly on getting buckets in the pain. In an effort to take some of the scoring pressure off Nautica, the team added transfers Alzena Henry, a center from Cal State Long Beach, guard Jasmine Phoolka, who made all-state last year for Fresno City College and guard Allissa Gomez, who made all-conference last season for East LA College. With only four games before conference play begins Nov. 29, Bonner said fundamentals are a priority. “We spend a lot of time on our fundamentals trying to get those in play so we can be preparing once conference comes around,” he said. One challenge that Bonner wants to address in the pre-season, is overconfidence. 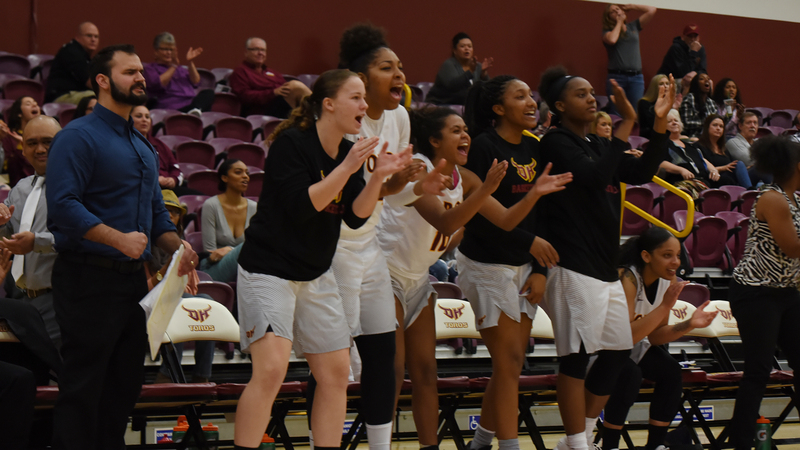 The women ballers have been one of CSUDH’s most successful programs recently, winning or sharing the conference title for three years from 2013-14 to 2015-16. In Bonner’s first season as interim coach, the team struggled in the new system, going 7-20 but rebounded last year, securing a spot in the conference tournament, losing to second-seeded Cal Poly Pomona.